Views help you and your team to easily revisit specific data points about your customers. Vitally can track a ton of data about your customers and users - from subscription details to product engagement data to anything in between. With so many data points available, you'll likely want to be able to easily revisit the most critical information about your customers. Views give you the ability to save common customer or user reports and revisit them with ease. Let's take a look! Let's say your product has an onboarding process that asks users to setup a couple of integrations and use a few features. Being able to easily view how new customers are progressing through this process is likely pretty important. In Vitally, you can easily build a report that prioritizes this information. To get start, click the Create New View button in the Views dropdown displayed above your Accounts or Users list. Simply 1) name your View (e.g. 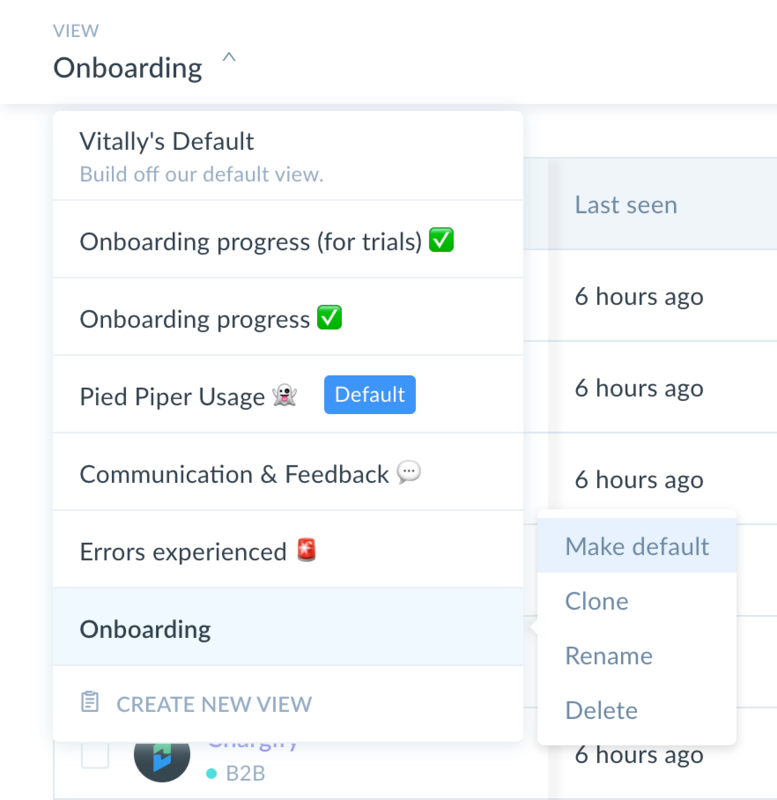 "Onboarding"), 2) add columns to it, 3) order those columns as you like, and 4) save your changes. You'll then be able to revisit this View (with updated data) at any time by selecting it via the Views dropdown in the top left. Once a View is created, it can be cloned, edited, and deleted by hovering over a View in the dropdown list and clicking the 'options' icon. You can even select a View to be the default upon future visits. Note that this default applies to all users - i.e. your teammates will see the default view on future visits as well (not just you). Wondering how Views work in practice? Check out our example Views in our live demo!